This article is about the concept in Christian theology. For other uses, see Absolution (disambiguation). May our Lord Jesus Christ absolve you; and by His authority I absolve you from every bond of excommunication (suspension) and interdict, so far as my power allows and your needs require. [making the Sign of the Cross:] Thereupon, I absolve you from your sins in the name of the Father, and of the Son, + and of the Holy Spirit. Amen. Deus, Pater misericordiárum, qui per mortem et resurrectiónem Fílii sui mundum sibi reconciliávit et Spíritum Sanctum effúdit in remissiónem peccatórum, per ministérium Ecclésiæ indulgéntiam tibi tríbuat et pacem. Et ego te absolvo a peccatis tuis in nomine Patris, et Filii,+ et Spiritus Sancti. The essential part of the formula (the words which must be said for the absolution – and the entire Sacrament of Penance – to take effect, or, in Church law terms, be "sacramentally valid") are: "Ego te absolvo", in English "I absolve you". Absolution of sins most importantly forgives mortal sins (and, if one does not commit a mortal sin after having been validly absolved, enables one to die in the "state of grace", able to eventually enter heaven); but it also allows the valid and non-sinful reception of the sacraments (especially the Eucharist at Mass), the lawful exercise of ecclesiastical offices and ministries by laity or clerics, and full participation in the life of the Church. However, for certain especially grave sins to be forgiven and for the accompanying Church penalties to be lifted, there are formal processes which must take place along with the absolution, which must then be given (depending on the seriousness of the type of sin) either by the Pope (through the Apostolic Penitentiary), the local Bishop, or a priest authorized by the Bishop. This formula is preceded by other short prayers similar to those used at Mass after the Confiteor. Suspension, in the context of the formula for absolution, refers to a canonical penalty which can be incurred only by clerics; therefore, it is omitted when absolving a layman. Some priests use, in both the ancient and the more recent form, a short prayer for the spiritual well-being of the penitent: Passio Domini nostri Jesu Christi, merita Beatae Mariae Virginis et omnium sanctorum, quidquid boni feceris vel mali sustinueris sint tibi in remissionem peccatorum, augmentum gratiae et praemium vitae aeternae. Amen. (May the Passion of Our Lord Jesus Christ, the merits of the Blessed Virgin Mary and of all the saints and also whatever good you do or evil you endure be cause for the remission of your sins, the increase of grace and the reward of life everlasting. Amen). This prayer shows the concepts of merit and the Communion of Saints in the greater context of grace as understood in Catholic theology. Absolution forgives the guilt associated with the penitent's sins, and removes the eternal punishment (Hell) associated with mortal sins, but only if the penitent has a firm purpose of amendment and is truly contrite. The penitent is still responsible for the temporal punishment (Purgatory) associated with the confessed sins, unless an indulgence is applied or, if through prayer, penitence and good works, the temporal punishment is cancelled in this life. a serious need is present, that is, the number of penitents is so large that there are not sufficient priests to hear the individual confessions properly within a reasonable time (generally considered to be 1 month) so that the Catholics, through no fault of their own, would be forced to be deprived of the sacrament or communion. The diocesan bishop must give prior permission before general absolution may be given under this circumstance. It is important to note that the occurrence of a large number of penitents, such as may occur on a pilgrimage or at penitential services is not considered as sufficient to permit general absolution. The second circumstance is thus envisaged more for mission territories where priests may visit certain villages only a few times a year. For a valid reception of general absolution, the penitent must be contrite for all his mortal sins and have the resolution to confess, at the earliest opportunity, each of those mortal sins forgiven in general absolution. Anyone receiving general absolution is also required to make a complete individual confession to a priest as soon as possible. An historical example is the absolution given by Fr. William Corby to the Irish Brigade during the Battle of Gettysburg in 1863. Contemporary examples of general absolution are the Three Mile Island nuclear accident, where general absolution was granted to all Catholics endangered by the incident, and the firefighters, many of whom were Italian and Irish, who were granted general absolution by local priests before heading into the burning World Trade Towers on September 11, 2001 terrorist attacks. The proper belief of imminent danger of death is a sufficient rationale to administer the rite, even though the actual danger might not actually exist. The general absolution was given by Honolulu Bishop Clarence Richard Silva to people at a church programme during the 2018 Hawaii false missile alert as it was believed that direct nuclear attack from North Korea was imminent. The French form absoute is used in English for the absolution of the dead, a series of prayers said after the Requiem Mass. The absolution of the dead does not forgive sins or confer the sacramental absolution of the Sacrament of Penance. Rather, it is a series of prayers to God that the person's soul will not have to suffer the temporal punishment in Purgatory due for sins which were forgiven during the person's life. The absolution of the dead is only performed in context of the Tridentine Mass. Eastern Orthodoxy is made up of a loose confederacy of Christian churches in the Eastern tradition and the eastern region, sharing the same or similar doctrine and practice. As a professed Christian Congregation, Eastern Orthodoxy is the second largest Christian church in the world, with an estimated 225–300 million adherents, primarily in Eastern and Southeastern Europe and the Middle East. It claims and teaches that it is the One, Holy, Catholic and Apostolic Church established by Jesus Christ in his Great Commission to the disciples almost 2,000 years ago. The main branches of Eastern Orthodoxy are considered by many to be the Greek Orthodox and the Russian Orthodox. And both have similar views on repentance and absolution. The Greek Orthodox Church has always believed that the Church has power to forgive sin. This is made clear by the formulæ of absolution in vogue among all branches within Eastern Orthodoxy; also from the decrees of synods which since the Reformation have again and again expressed this belief. (Alzog on Cyril Lucaris III, 465; Synod of Constantinople, 1638; Synod of Jassy, 1642; Synod of Jerusalem, 1672) In the Synod of Jerusalem the Church reiterates its belief in Seven Sacraments, among them Penance, which Christ is believed to have established when he said: "Whose sins you shall forgive they are forgiven them, and whose sins you shall retain they are retained." The formulæ of absolution are generally deprecatory, and if now and then the indicative form appears, it may be traced to Latin sources. The belief of the Greek Church is naturally also that of the Russian in this regard. Russian Orthodox theologians all hold that the Church possesses the power to forgive sins, where there is true repentance and sincere confession. The form in use at present is as follows: "My child, N. N., may our Lord and God Christ Jesus by the mercy of His love absolve thee from thy sins; and I, His unworthy priest, in virtue of the authority committed to me, absolve thee and declare thee absolved of thy sins in the name of the Father, and of the Son, and of the Holy Ghost, Amen." In the Church of England and in the Anglican Communion in general, formal, sacramental absolution is given to penitents in the sacrament of penance now formally called the Reconciliation of a Pentitent and colloquially called "confession." There is also a general absolution given after general confessions in the offices of Morning and Evening Prayer and after the general confession in the Eucharist. Often, physical actions accompany an absolution. A priest or bishop makes the sign of the cross over the congregation. Those receiving the absolution may make the sign of the cross as well. At minimum, Anglican prayer books contain a formula of absolution in the daily offices, at the Eucharist, and in the visitation of the sick. The first two are general, akin to the liturgical absolution in use in the Roman Church; the third is individual by the very nature of the case. The offices of the earliest Books of Common Prayer contained an absolution that read both as assurance of pardon, placing the agency with God ("He [God] pardoneth and absolveth all them that truly repent"), and as priestly mediation (God "hath given power and commandment to his ministers to declare and pronounce to his people...the absolution and remission of their sins"). The following is the form of absolution for the sick in the Book of Common Prayer: "OUR Lord Jesus Christ, who hath left power to his Church to absolve all sinners who truly repent and believe in him, of his great mercy forgive thee thine offences: And by his authority committed to me, I absolve thee from all thy sins, In the Name of the Father, and of the Son, and of the Holy Ghost. Amen." Canada's Book of Alternative Services nuances the words of absolution slightly: "Our Lord Jesus Christ, who has left power to his Church to forgive sins, absolve you through my ministry by the power of his Holy Spirit and restore you to the perfect peace of the Church". Oriental Orthodoxy is the faith of those Eastern Christian churches which recognize only the first three ecumenical councils—the First Council of Nicaea, the First Council of Constantinople and the First Council of Ephesus. They rejected the dogmatic definitions of the Council of Chalcedon held in AD 451 in Chalcedon. Hence, these Oriental Orthodox churches are also called Old Oriental churches, Miaphysite churches, or the Non-Chalcedonian churches, known to Western Christianity and much of Eastern Orthodoxy as Monophysite churches (although the Oriental Orthodox themselves reject this description as inaccurate, having rejected the teachings of both Nestorius and Eutyches). These churches are in full communion with each other but not with the Eastern Orthodox churches. Slow dialogue towards restoring communion began in the mid-20th century. Many branches have slight variations in their doctrine of absolution and penance. Denzinger, in his Ritus Orientalium (1863), gives us a full translation of the penitential ritual used by the Armenians. The present version is from the ninth century. The form of absolution is declarative, though it is preceded by a prayer for mercy and for pardon. It is as follows: "May the merciful Lord have pity on thee and forgive thee thy faults; in virtue of my priestly power, by the authority and command of God expressed in these words, 'whatsoever you shall bind on earth shall be bound in heaven', I absolve thee from thy sins, I absolve thee from thy thoughts, from thy words, from thy deeds, in the name of the Father, and of the Son, and of the Holy Ghost, and I restore thee to the Sacrament of the Holy Church. May all thy good works be for thee an increase of merit, may they be for the glory of life everlasting, Amen." Henri Hyvernat asserts that the liturgical books of the Copts have no penitential formulæ, nor is this surprising, for they inscribe in the ritual only those things not found in other rituals. Father du Bernat, writing to Père Fleurian (Lettres édifiantes), says, in reference to the Sacrament of Penance among the Copts, that the Copts believe themselves bound to a full confession of their sins. This finished, the priest recites over them the prayer said at the beginning of the Mass, the prayer asking pardon and forgiveness from God; to this is added the so-called "Benediction", which Father Bernat says is like the prayer said in the Latin Church after absolution has been imparted. Hyvernat, however, asserts that Father Bernat is mistaken when he likens the Benediction to the Passio Domini, for it is like the Latin prayer only inasmuch as it is recited after absolution. The Syrians who are united with the Roman See use the declarative form in imparting absolution, a relatively recent formula. The present Jacobite Church not only holds and has held the power to absolve from sin, but its ritual is expressive of this same power. Denzinger (Ritus Orientalium) has preserved for us a 12th-century document which gives in full the order of absolution. Luther's earliest writings speak of baptism, eucharist, and absolution as three distinct sacraments, although in his later works he came to see absolution not as a separate sacrament, but rather an extension of the forgiveness expressed and experienced in the sacrament of baptism. In the 1529 Large Catechism (and therefore also the 1580 Book of Concord) he speaks of absolution as "the third Sacrament", stating "And here you see that Baptism, both in its power and signification, comprehends also the third Sacrament, which has been called repentance, as it is really nothing else than Baptism. For what else is repentance but an earnest attack upon the old man (that his lusts be restrained) and entering upon a new life?" Today Lutherans practice "confession and absolution" in two forms. They, like Roman Catholics, see James 5:16 and John 20:22-23 as biblical evidence for confession. The first form of confession and absolution is done at the Divine Service with the assembled congregation (similar to the Anglican tradition). Here, the entire congregation pauses for a moment of silent confession, recites the confiteor, and receives God's forgiveness through the pastor as he says the following (or similar): "Upon this your confession and in the stead and by the command of my Lord Jesus Christ, I forgive you all your sins in the name of the Father and of the Son and of the Holy Spirit." 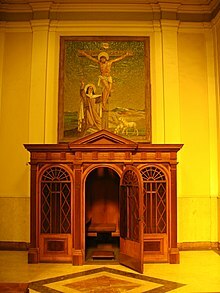 The second form of confession and absolution is known as "Holy Absolution", which is done privately to the pastor (commonly only upon request). Here the person confessing (known as the "penitent") confesses his individual sins and makes an act of contrition as the pastor, acting in persona Christi, announces this following formula of absolution (or similar): "In the stead and by the command of my Lord Jesus Christ I forgive you all your sins in the name of the Father and of the Son and of the Holy Spirit." In the Lutheran Church, the pastor is bound by the Seal of the Confessional (similar to the Roman Catholic tradition). Luther's Small Catechism says "the pastor is pledged not to tell anyone else of sins told him in private confession, for those sins have been removed". The earliest Reformers attacked the penitential practice of the Catholic Church, but differed in their teaching on the subject. The opinions expressed by some reformers in their later theological works do not differ as markedly from the old position as one might suppose. Martin Luther, whilst rejecting Catholic methodology (particularly of the listing and enumeration of individual sins, and the practice of mandatory confession), nonetheless praised the practice of confession, and described it as a sacrament in his early writings, and in the 1529 exhortation, also writing "Here we should also speak about confession, which we retain and praise as something useful and beneficial". Huldrych Zwingli held that God alone pardoned sin, and he saw nothing but idolatry in the practice of hoping for pardon from a mere creature. If confession had aught of good it was merely as direction. He saw no value in the confession of sins to a pastor, and no measure of sacramentality in the practice of confession. One or more of the preceding sentences incorporates text from a publication now in the public domain: Herbermann, Charles, ed. (1913). "Absolution" . Catholic Encyclopedia. New York: Robert Appleton. ^ "The Catechism of the Council of Trent - The Sacrament of Penance". ^ "Code of Canon Law - The Celebration of the Sacrament". Libreria Editrice Vaticana. 1983. ^ Fr. William Saunders (1998). "Straight Answers: Is General Absolution Allowed?". Arlington Catholic Herald. ^ Joseph Pronechen (2011). "Remembering 9/11". National Catholic Register - EWTN News, Inc.
^ "Missile alert prompts Hawaii bishop to give rare 'general absolution'". Catholic Herald. Retrieved 5 March 2019. ^ "Major Branches of Religions". adherents.com. ^ Mary Fairchild. "Eastern Orthodox Church Denomination". About.com Religion & Spirituality. ^ F. Belton Joyner, Jr. (1 September 2010). The Unofficial United Methodist Handbook. Abingdon Press. p. 102. ISBN 9781426724961. Confession is an "office of the keys" (see Matthew 16:19) belong to all baptized persons, that is, anyone may confess and any believer may pronounce the word of forgiveness. A declaration of forgiveness is permanent and binding because it comes from Jesus Christ himself. ^ "1996 Discipline ¶ 332". General Conference 2000. The United Methodist Church. 5. All clergy of The United Methodist Church are charged to maintain all confidences inviolate, including confessional confidences. ^ "Holy Baptism". The Book of Concord. Retrieved 27 August 2018. ^ "A brief admonition to confession". bookofconcord.org. Retrieved 27 August 2018. ^ "Luther on Confession and Absolution". Concordia Academic. 2014. Retrieved 27 August 2018. ^ Ajay D'Souza. "Liberty of Electronic Cigarettes". liberalcatholic.org. Archived from the original on 2010-06-05. Look up absolution in Wiktionary, the free dictionary. Wikisource has the text of the 1911 Encyclopædia Britannica article Absolution. John N. Wall. A Dictionary for Episcopalians. Cambridge, Massachusetts: Cowley Publications, 2000. Melanchthon, Philip. The Augsburg Confession Article XI: Of Confession.